New Puppies are here see for sale page Born 11/21/09!!! Hello and thanks for stopping by, Opaxse AmStaffs welcomes you! Here at Opaxse AmStaffs my first and foremost concern within and reproduced from my AmStaffs is unquestionable, 100% reliable temperament day in and day out. Next to that correct conformation according to the AKC standard. 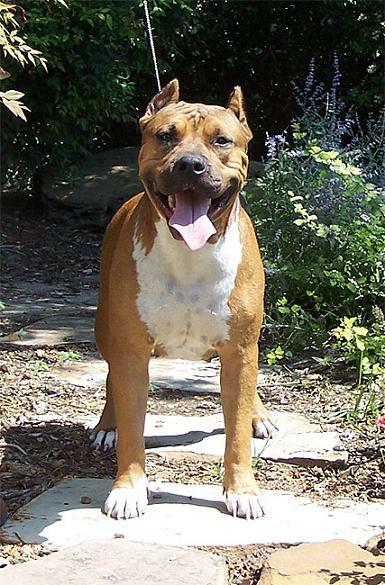 The American Staffordshire Terrier is a breed that wants nothing more than its masters attention with a strong desire to please. This animal is all heart! Whether you seek a Companion,Show,or Working dog....Opaxse AmStaffs has the looks,reliability,and health guarantee you seek. If you are looking for Temperament,Health,Wits, Substance, and Unmatched Looks you have come to the right place. Please note that Opaxse AmStaffs strives to only place its extended four legged family members in responsible,loving, and safe environments. The future of this great and misunderstood breed depends on responsible ownership. All applicants will be screened and No dogs will be sold for illegal uses! Feel free to contact me with any questions. Serious inquiries only.